Born in the magical land of Colombia, Andres has been practicing Yoga for over 26 years. Besides traveling and studying intensively in India, Andres is an accomplished yoga teacher, retreat facilitator and Kirtan leader worldwide, based in Los Angeles,CA. 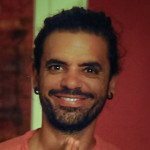 Andres joined the teaching staff of Power Yoga in 2005 and is the founder of Power Soul Yoga, a dynamic, soulful and well rounded approach into the science of Yoga. His teaching style promotes equanimity, traveling through the principles of Yoga as a therapy, empowering students to trust their own experience with sensitivity and intimacy, merging the ancient and sacred with the contemporary. Power Soul Yoga emphasizes the most natural tools for the enhancement of the physical, mental and spiritual aspects. This morning lateral strengthening flow workout is designed to tone and strengthen weak links in the body.